Lead-DBS is on twitter and facebook! For the social media guys out there, we decided to go on twitter and facebook! Please feel free to follow us for some Lead-DBS and general DBS related updates. http://www.lead-dbs.org/wp-content/uploads/logo_icon.png 0 0 andreashorn http://www.lead-dbs.org/wp-content/uploads/logo_icon.png andreashorn2016-03-03 01:06:002016-03-03 01:23:33Lead-DBS is on twitter and facebook! 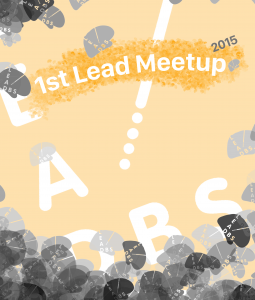 As a sort of kick-off meeting to new methods and developments of Lead-DBS coming in 2016, a first Lead Meetup was held in Berlin this December. We are really excited about a substantial number of new developments that will take the functionality of the toolbox further ahead. Stay tuned! We are happy to announce that since the initial publication of the methodological paper around Lead-DBS, there have been quite some studies that applied Lead DBS in a clinical research setting. Check out our publications page for more information. 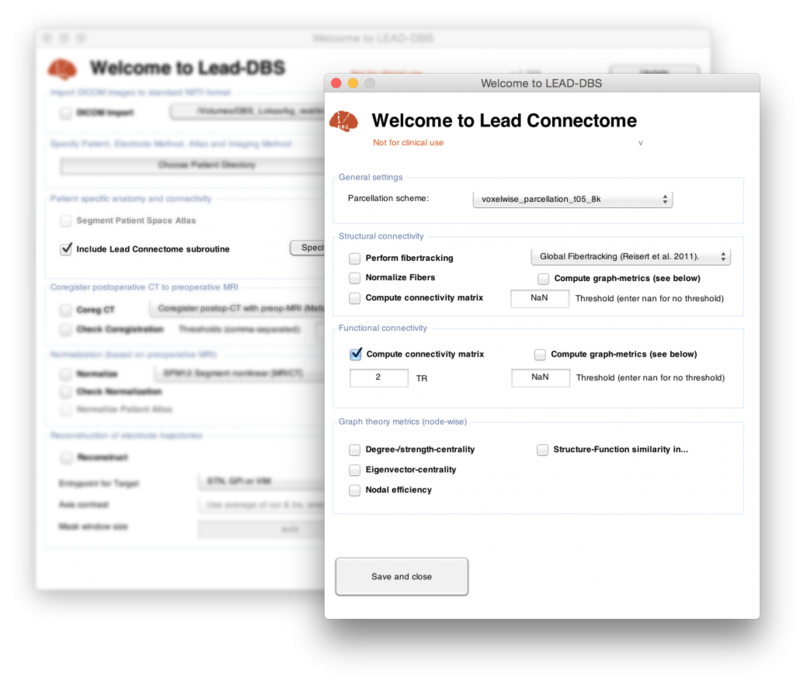 We are happy to announce a major update of Lead-DBS (v1.4). Novel electrode format – now any lead design you can think of is possible. This specifically adds support for the novel Boston Scientific Vercise directed leads to the toolbox (see picture). Also, custom made electrodes can be added easily. Co-registration between pre-op MRIs and post-op CTs works much more robustly now using BRAINSFit. fMRI/dMRI-based connectomic results can now be explored using both a seed-based and graph-theoretical approach in the 3D-viewer. In fMRI, you can even loop across time using a sliding-window approach. Even more importantly, I am very happy to mention that the development team has grown substantially: Welcome Ningfei Li, Philip Plettig & Siobhán Ewert to the team! We will continue to improve especially the new features in the upcoming months and there are a few nice new features already in the pipeline. As always, suggestions, comments and help (fork us on github) are most welcome. Let’s push the frontier a bit, shall we? 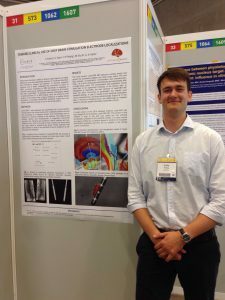 Michael Okun recently published a NEJM-article entitled “Deep-Brain Stimulation — Entering the Era of Human Neural-Network Modulation” and Jamie Henderson wrote a perspective paper in 2012 titled “Connectomic Surgery”. Thus, from now on, LEAD-DBS features a fully functional connectomic processing pipeline (DTI, rs-fMRI) that is simple to use and integrate to your work. 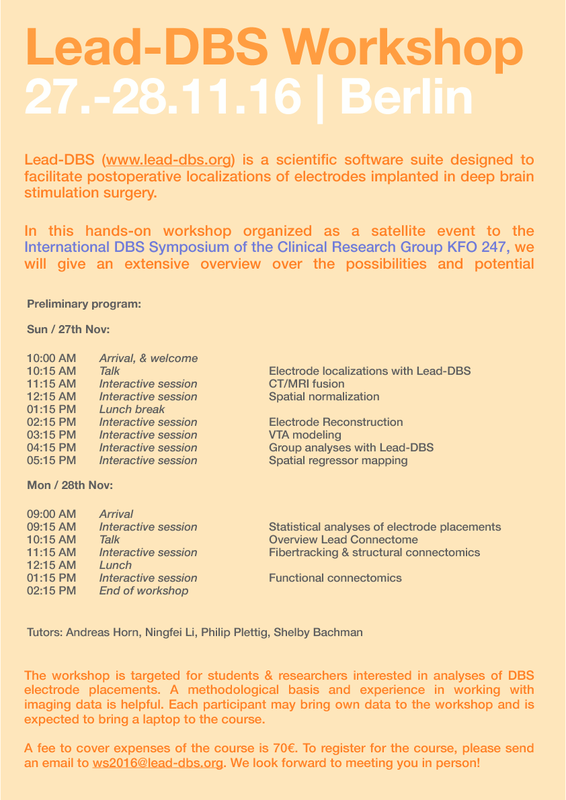 In this way, you can now also use LEAD-DBS for patients who did not even undergo surgery (e.g. for connectomic analyses or visualizations). 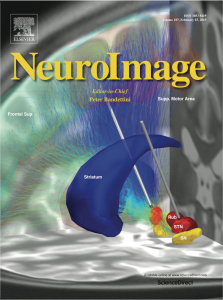 We are happy to share the current NeuroImage cover art with you, which shows a 3D rendering made with our toolbox (volume 107, 15 February 2015). Depicted is a thr ee-dimensional reconstruction of deep brain stimulation electrode placements in a patient suffering from Parkinson’s disease. 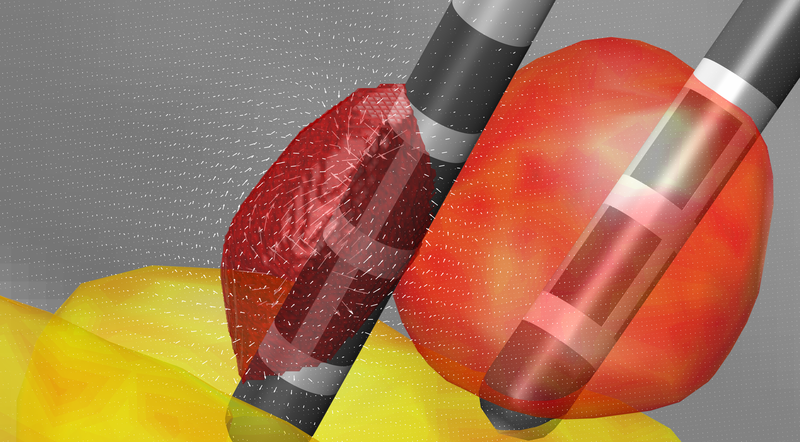 Using a novel open-source toolbox that is introduced in this issue of NeuroImage, the electrodes are modeled in their accurate position in the brain based on postoperative magnetic resonance imaging and using the accurate dimensions of the electrode lead model implanted in the patient’s brain. 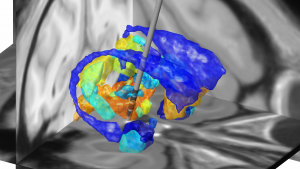 Using such a reconstruction of the stimulation setting, it can be determined, whether deep brain stimulation electrodes are accurately placed within the target structure – in this case the sensorimotor functional zone of the subthalamic nucleus. Moreover, the volume of tissue activated by the stimulation can be modeled using the actual stimulation parameters applied in the patient’s treatment. Lastly, based on the volume of activated tissue that has been modeled for a certain patient, diffusion weighted imaging based fiber-tracking may be used to analyze the influence of the stimulation on the whole structural (and functional) connectome of the patient’s brain. This combined approach allows the researcher to study local effects of the stimulation (associated with the placement of the electrode within the target structure), as well as distant effects effects (associated with the whole-brain network influenced by the stimulation).